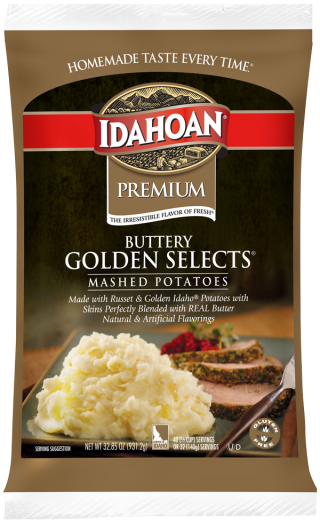 For a richer, heartier flavor, try Idahoan® Buttery Golden Selects® Mashed Potatoes. By adding golden potatoes, their peels – and a little extra butter – to the mix, we’ve created a recipe that we’re sure would do our grandmas proud. 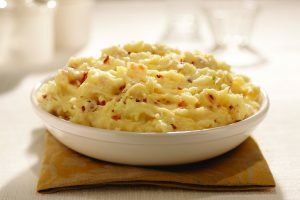 Our russet and golden potato blend is processed from 100% Idaho® potatoes and includes a little peel for that natural texture. Add entire pouch of potatoes at once using a spoon or wire whip to distribute evenly and wet all potatoes. Let stand 5-10 minutes, stir well and serve. 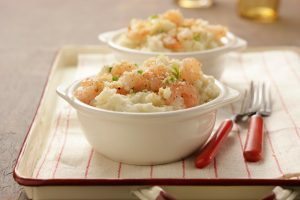 * For creamier mashed potatoes add more hot water. Measure 12 cups of boiling water and 4 cups of whole milk into 6? x ½ size steam table pan. Add entire pouch of potatoes at once using spoon or wire whip to distribute evenly and wet all potatoes. Let stand on steam table for a minimum of 20 minutes before serving. Stir well and serve. 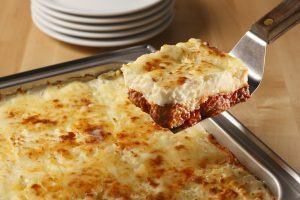 Idaho® potatoes (russet and gold varieties), vegetable oil (contains one or more of the following: coconut, palm, soybean, cottonseed, sunflower, canola), corn syrup solids, salt, maltodextrin, nonfat dry milk, sugar, sodium caseinate, butter powder [butter (sweet cream, salt, annatto color), nonfat milk solids, sodium caseinate and disodium phosphate], mono and diglycerides, calcium stearoyl lactylate, natural and artificial flavors (milk, soy), spice, sodium acid pyrophosphate (preserve freshness), sodium bisulfite (preserve freshness), dipotassium phosphate, artificial color, citric acid (preserve freshness), mixed tocopherols (preserve freshness) and less than 2% silicon dioxide added as an anti-caking agent.